Umgeni Water, KwaZulu-Natal's largest water board, is committed to supply potable water that is fit for life-time consumption. The organisation uses conventional and advanced treatment processes that are benchmarked to the specifications of international organisations, among them the American Water Works Association (AWWA) and the World Health Organisation (WHO). Umgeni Water is proud to state that the quality of potable water it produces consistently meets the requirements of the South African National Drinking Water Quality Standards (SANS 241:2015). In the financial year 2017/2018 (1st July 2017 - 30th June 2018) potable water produced by Umgeni Water was again regarded as excellent in terms of SANS 241:2015. 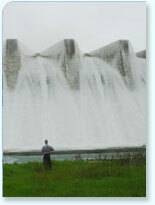 Umgeni Water's area of supply in KwaZulu-Natal is one of few parts of the world where one can drink water directly from a tap without fear of health implications, and Umgeni Water will work tirelessly with its customers (Municipalities/Water Services Authorities) to maintain such excellent potable water/drinking water standards. Umgeni Water's customers are eThekwini Metropolitan Municipality, Msunduzi Local Municipality and Ugu, Harry Gwala, iLembe, uMgungundlovu and uThukela District Municipalities. Umgeni Water supplies treated water in bulk to these municipalities for supply/distribution to consumers. It has come to the attention of Umgeni Water that there is speculation and/or rumours on certain social media platforms that potable water in parts of Durban is not safe to drink. This information is untrue. As already stated, water abstracted by Umgeni Water is treated to high and regulated standards and is safe to drink. Consumers are urged to ignore the rumour/speculation.